Virgin Galactic's VSS Unity spaceliner soars above Earth during the craft's third rocket-powered test flight, which occurred on July 26, 2018. 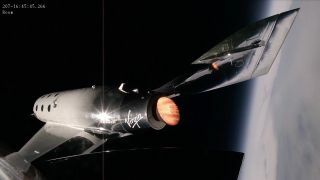 Virgin Galactic's suborbital space plane VSS Unity just soared to new heights, and you can go along for the ride, thanks to a new video. The newly released video compresses the flight into 2.5 visually stunning minutes. Viewers see Unity carried into the skies above the Mojave Air and Space Port in Southern California by the plane's WhiteKnightTwo mothership, which is called VMS Eve. Unity began flying freely at an altitude of 46,500 feet (14,170 m), and the video captures the dramatic drop: The winged spacecraft falls away toward the Mojave Desert floor for a moment, before the plane's onboard rocket engine roars to life and blasts Unity onward and upward. The space plane got high enough for pilots Dave Mackay and Mike "Sooch" Masucci — and all of us, vicariously — to see the curvature of Earth against the blackness of space. "That is a million-dollar view out the window, Dave," Masucci said in the video, which also features in-cockpit shots of the two pilots operating the vehicle. Mackay and Masucci soon steered Unity safely home; the video ends with the space plane touching down at the Mojave Air and Space Port, as onlookers cheer the craft's return. Unity is the second SpaceShipTwo vehicle, which Virgin Galactic is developing to take paying customers and scientific payloads on brief trips to suborbital space. The first edition, Enterprise, broke apart during an October 2014 test flight, killing co-pilot Michael Alsbury and wounding pilot Peter Siebold. Unity's first two rocket-powered flights occurred in April and May of this year. If testing continues to go well, the space plane could begin commercial flights soon — perhaps even before the end of the year, Virgin Galactic founder Sir Richard Branson has said. Hundreds of people have already booked a seat aboard the six-passenger spacecraft. Tickets currently sell for $250,000 apiece.